About Cerbaco Ltd. - The Leader in Non-Metallic Weld Backing - CERBACO LTD.
CERBACO Ltd. was created in 1977 to fill a much needed void in the welding market. It was founded by Alan Flash, a metallurgist, who understood the needs and concerns of welders and above all, the properties of the materials to be welded. More than 30 years after inception, Cerbaco Ltd. remains the leader in the non-metallic weld backing industry. We take pride in the services that only we can offer. At Cerbaco, we will provide complete technical assistance and will direct proper use of our products. If your application requires something special, we will design custom shapes and sizes. In addition we will, if necessary, develop new backing formulations. 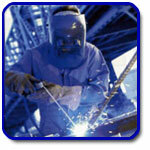 We have worked with welding engineers all over the world to solve their problems. We can solve yours as well.